Only 6 weeks to go till Christmas, so you better hurry up if you want to make some Christmas decorations for your tree. Making them yourself makes this whole period more fulfilling. It will create the Christmas atmosphere in the house, weeks in advance. With this easy pattern it will be ready in no time. 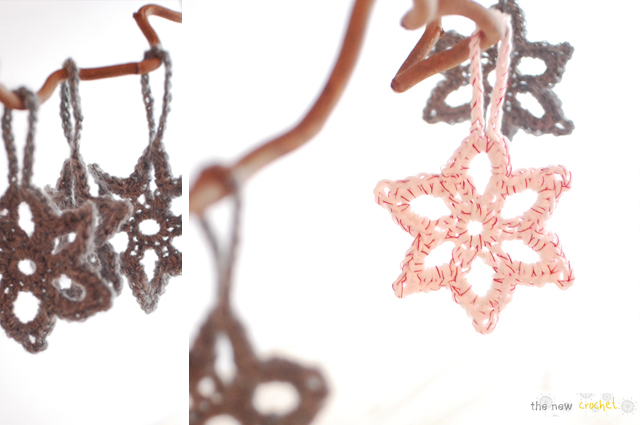 I have also tried the same pattern with a normal acrylic yarn (the grey ones ) but as it is not heavy enough it won't hang so nice in the tree. Ch 5 on hook size 3 mm and form a ring with 1 sl st in first ch. Row 1: ch 1, 11 sc in ch-ring, finish with 1 sl st in first ch. Row 2: ch 2, * 1 dc in next sc, ch 6, 1 dc in next sc *, repeat 5 times, 1 dc in next sc, ch 6, finish with 1 sl st in 2nd ch from beg of round = 6 ch spaces. Row 3: ch 1, * 1 sc between the next 2 dc, 4 sc in ch space, ch 3, 1 sc in 3rd ch from hook, 4 sc in ch space *, repeat from *-* a total of 5 times, 1 sc between the next 2 dc, 4 sc in ch space, ch 20, 4 sc in ch space, finish with 1 sl st in ch from beg of round. 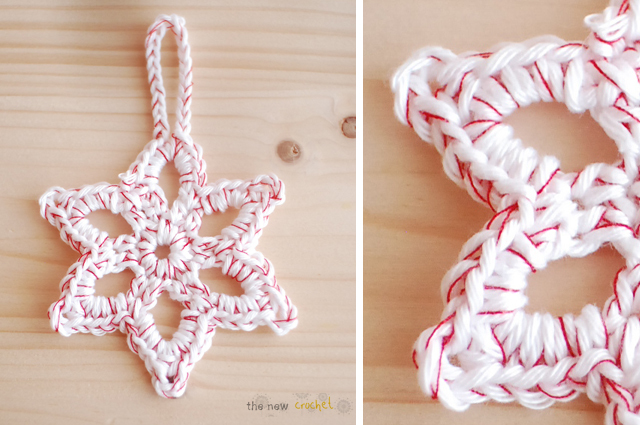 Hi Sonja, it is an easy pattern,finished in no time but elegant. Hope it works out well for you! This is a lovely star! Thank you so much for sharing the tutorial! This is perfect for my 8 month old's Christmas tree, thank you!! Lovely! Thank you for sharing this pattern. WOW! What a lovely Christmas star! I was looking around for a nice pattern. I find it!!! Thank you very much for sharing!!! May I share it on my blog to my followers? I do it only with your permission. Dankjewel! Thank you very much! It is in Dutch, but the photos tell enough! Thank you so much for the pattern <3 Gonna make a bunch of these for myself and to give away :) And also great idea with the sewing thread ! Instantly makes the yarn a bit more interesting ! the star i have been looking for. Lovely. Thanks! Thank you for this pattern! It's a very lovely star!! Maybe my email went to your spam box so I write again here. I tried to crochet this ornament but didn't manage. The 11 stitches seem to be too many, in the second row I could repeat the pattern more times than only 6 total. Where do I read it wrong? Hi Agata, indeed I did not get an email. Basically in Row1 you will have 12 single crochets in the ring and in Row2 you will make 1 double crochet in 1 single crochet of Row1 than you chain 6 and make another double crochet in the 2nd single crochet of Row 1. So for each 6 space you will need to use 2 single crochets of Row1 and this you will have to repeat 5 more times. So normally it should work. I hope I made some sense. If you prefer to see this in a schematical drawing please let me know and I will add this to the post. Hope you will let me know if it would work after this explanation. Thank you for sharing, I will place it on my blog today. And I will tell the readers that they can find the pattern at your blog. It was very nice to crochet, and a great idea. Hi Sarah, thank you for the lovely blogpost. Hope people loved your present :-). Cheers, Alex. This was such an awesome pattern. I made 2 already and I love the outcome. Beautiful! Mind if I sell them? I hope you still check this--I'm a beginner but get lost after row 2. What are the "chain spaces" then? I wish you posted some photos of the process or a video :(. If you wouod do that, I would love it! I love this little star! I think I may have the same problem as above, I'm on round three and have done the chain, sc inbetween the previous rows double, done 4 sc chain three but I'm not sure where to put the single crochet. When I put it in the 3rd chain from the hook(I'm assuming into round 2 3rd from the hook) then do the next four in the same chain space as the previous 4sc it doesn't look right.....I'm hoping you clarify where to put that 1sc that goes in between the 2 sets of 4sc....I hope that makes sense the way I said that.